As a kid growing up with a fishing rod in my hands, I always looked forward to the arrival of the World Record Game Fishes book every year from the International Game Fish Association. Within it were great stories from destinations around the world, along with world records for just about any species of fish a young boy could imagine. I’d daydream about trolling those giant dead baits for thousand-pound black marlin on the Great Barrier Reef, something I still have not had a chance to do. 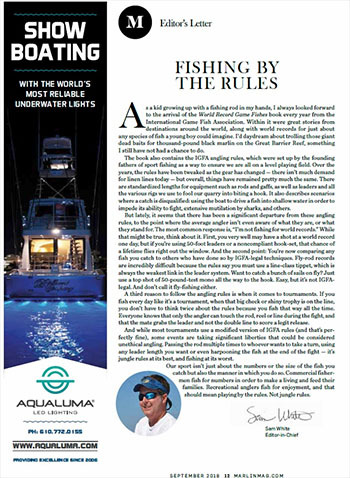 The book also contains the IGFA angling rules, which were set up by the founding fathers of sport fishing as a way to ensure we are all on a level playing field. Over the years, the rules have been tweaked as the gear has changed — there isn’t much demand for linen lines today — but overall, things have remained pretty much the same. There are standardized lengths for equipment such as rods and gaffs, as well as leaders and all the various rigs we use to fool our quarry into biting a hook. It also describes scenarios where a catch is disqualified: using the boat to drive a fish into shallow water in order to impede its ability to fight, extensive mutilation by sharks, and others. But lately, it seems that there has been a significant departure from these angling rules, to the point where the average angler isn’t even aware of what they are, or what they stand for. The most common response is, “I’m not fishing for world records.” While that might be true, think about it. First, you very well may have a shot at a world record one day, but if you’re using 50-foot leaders or a noncompliant hook-set, that chance of a lifetime flies right out the window. And the second point: You’re now comparing any fish you catch to others who have done so by IGFA-legal techniques. Fly-rod records are incredibly difficult because the rules say you must use a line-class tippet, which is always the weakest link in the leader system. Want to catch a bunch of sails on fly? Just use a top shot of 50-pound-test mono all the way to the hook. Easy, but it’s not IGFA legal. And don’t call it fly-fishing either. A third reason to follow the angling rules is when it comes to tournaments. If you fish every day like it’s a tournament, when that big check or shiny trophy is on the line, you don’t have to think twice about the rules because you fish that way all the time. Everyone knows that only the angler can touch the rod, reel or line during the fight, and that the mate grabs the leader and not the double line to score a legit release. And while most tournaments use a modified version of IGFA rules (and that’s perfectly fine), some events are taking significant liberties that could be considered unethical angling. Passing the rod multiple times to whoever wants to take a turn, using any leader length you want or even harpooning the fish at the end of the fight — it’s jungle rules at its best, and fishing at its worst. Our sport isn’t just about the numbers or the size of the fish you catch but also the manner in which you do so. Commercial fishermen fish for numbers in order to make a living and feed their families. Recreational anglers fish for enjoyment, and that should mean playing by the rules. Not jungle rules.